Happy December!!! The weather the last few weeks here in southern Iowa has been much warmer than we would expect this time of year but that all changed yesterday. We got up to a warm, windy day and then the temperatures fell all afternoon and evening for a difference of 40some degrees and now it really does feel like winter out and there is a chance of snow on Friday. It's all good though!!! I know we are all thinking about Christmas and creating our Christmas cards but I just couldn't resist making a card using the brand new Leaves set of stamps. Like I said, it had been warm here - much more like fall than Christmas coming. My main panel began with glossy white cardstock. 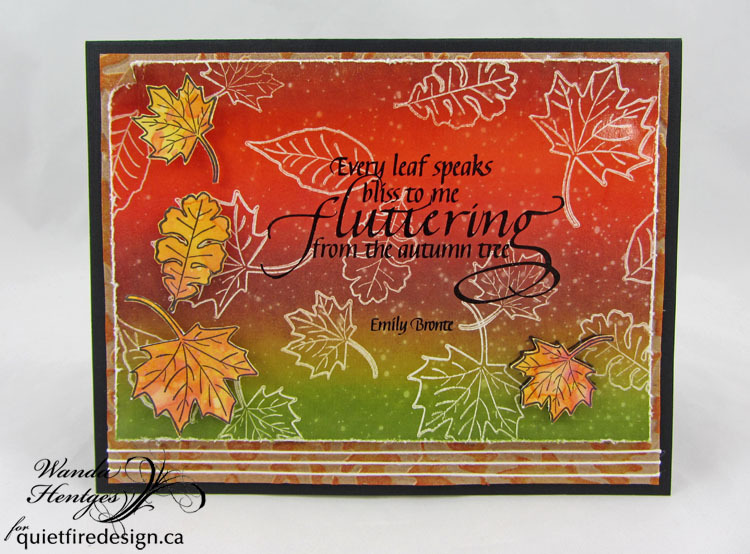 I stamped the leaves with Ranger's Watermark Resist ink and then pulled out one of my old Kaleidacolor ink pads, Autumn Leaves, and a brayer to add the color over the resist. After brayering on the color, I buffed the surface with a paper towel, spritzed water over the panel, blotted it and dried it. Beautiful!!! I used a stamp platform to stamp the quote so I could stamp it multiple times getting the black nice and dark. 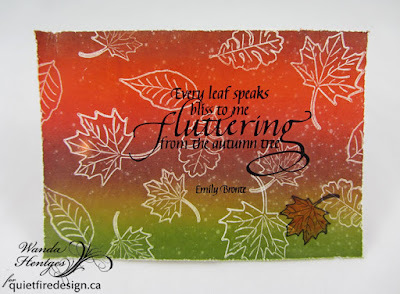 I stamped one leaf with black down in the corner and without thinking rubbed over it without first drying the black ink smearing it just a bit. I went ahead and colored it with a marker but ultimately decided to layer a leaf over it. I stamped the leaves on a piece of Distress Oxide background I had left over and cut them out. 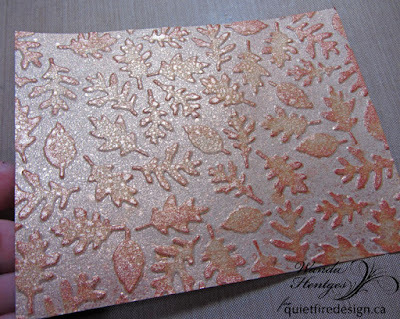 For the next layer I used Kraft cardstock, embossed it with the Tim Holtz/Sizzix leaves folder, rubbed the Distress Ink Spiced Marmalade ink pad over the panel and then sprayed it with Distress Mica Spray Antique Bronze. Here we have the card all put together. The edges of the main panel are distressed and I curled that top left corner because I wrinkled it while distressing the edge. 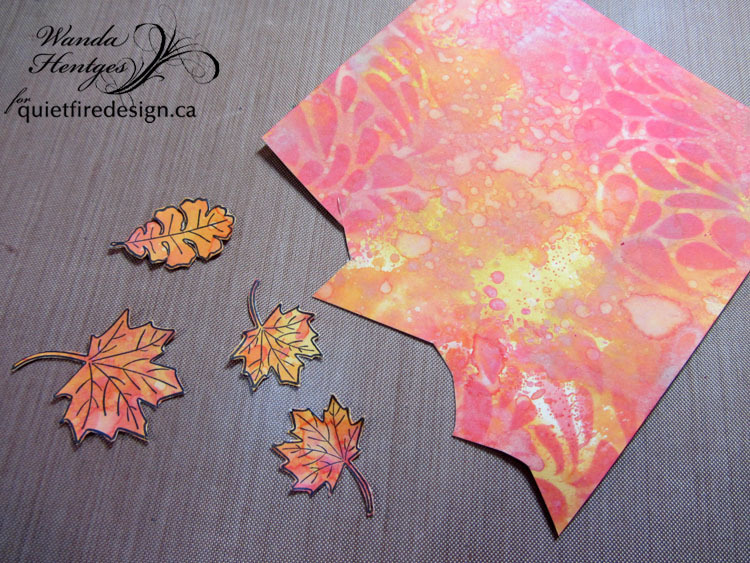 The leaves are attached with foam tape and the main panel is attached with foam tape. 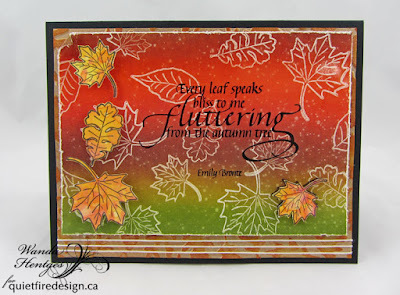 I put this to the top of the embossed panel and then added Tim Holtz Craft Thread at the bottom. Everything is attached to a folded black card. Thanks for following along!!! 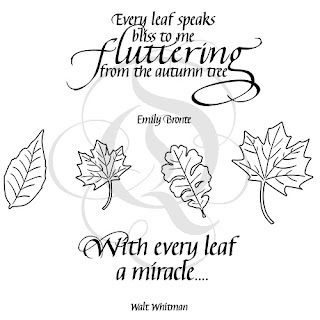 I hope you've enjoyed today's card!!! This is an absolutely beautiful card! What a stunning card! 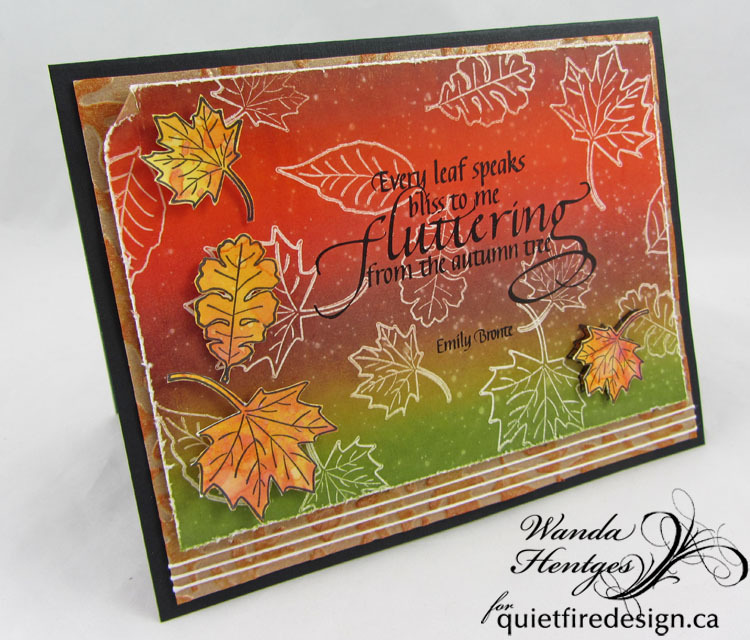 Love the textures and details, Wanda. Fabulous! See our A Way With Words eBook! Share us on your blog! Copy and paste this code. Thanks!